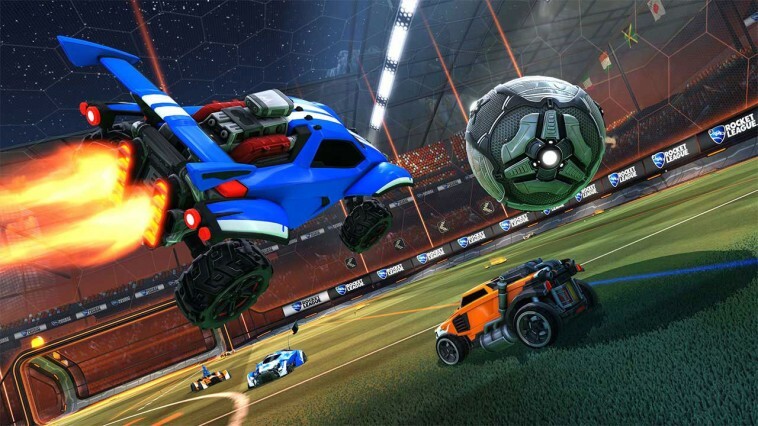 Rocket League took the gaming world by storm when it made its debut back in 2015 and, ever since, the popularity of this football and driving hybrid has only continued to soar. 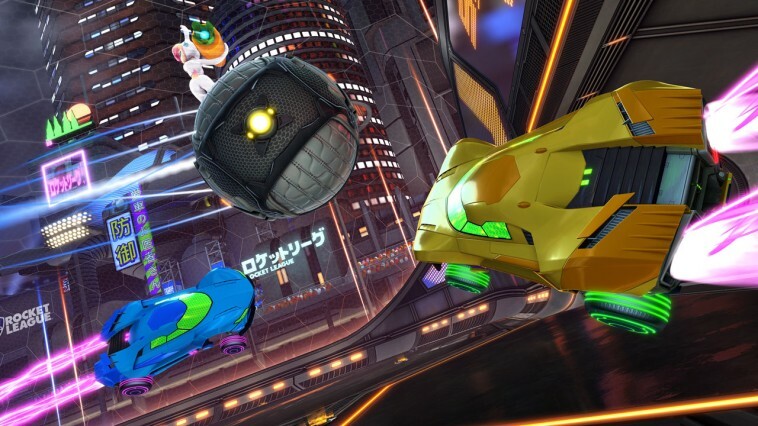 Developer Psyonix now look to continue that success on the Nintendo Switch, and with gamers practically frothing at the mouth for a version of Rocket League that they can take anywhere, what could possibly go wrong? The core concept behind Rocket League is an extremely simple one – take the game of football and replace its human players with cars. Teams consist of anywhere between one and four players – one-on-one matches feel a little empty on the pitch while a quartet too chaotic. It’s the two and three-man (or car in this case) team games that feel like the sweet spot delivering just the right balance of teamwork, chaos and unpredictability. The vehicles handle in an almost toy-car like manner, able to manoeuvre easily, double jump and even spin in the air for angling your shots (or at least trying to). There are no real rules so to speak other than score goals so bumping, charging and even exploding your opponents is often encouraged. Getting to grips with the physics of not only the giant ball but the cars themselves is tough especially in the early going, however, it’s this difficulty that makes every save or shot on goal all the more satisfying when you manage to pull them off successfully. And that’s really where Rocket League’s real appeal lies – its so simple but ever so rewarding gameplay. Everything about the way your car handles feels good. Every leap off the side of a wall or simply utilising your entire boost meter to make it back to your goal for a well-timed block. With matches limited to five minutes apiece, one game can quickly turn into five then into ten and so on. All extra modes that have been added to Rocket League over the years are all here and accounted for. These include the basketball-inspired Hoops, Snow Day which sees the ball replaced with a giant puck you can slide along the slippery floor, and Rumble that throws in Mario Kart-style weapons like an extending glove or the ability to freeze the ball in place. While never quite reaching the same level of enjoyment as the standard settings, they do mix up the fundamentals in some neat ways that make them great for jumping into every now and again. It’s clear that Rocket League was very much designed with multiplayer in mind, the game’s season mode offering single players a very bare bones package. Here you’ll face off against a number of other AI controlled teams within a league in a series of matches. With the option to choose the difficulty of your opponents, the season mode acts as more of a chance to hone your skills before venturing into the competitive world of online as opposed to something that will keep you busy for hours and hours. Online works surprisingly well with nearly every match played running super smooth and no major issues whether tackling strangers or joining a party with my friends (yes you can easily create parties thankfully). There has been the odd handful that have seen a little bit of lag but, even then, its never for more than five or ten seconds. The quantity of players online has also never been an issue no matter what mode I tried – likely a result of the fact you can play against those using the Xbox One or PC version of the game as well. Overall the game’s online features stack up nicely against the other platforms with just one exception – no voice chat. A disappointing absence but a familiar one on Switch that no amount of text chat can replace. The Switch continues to establish itself as the go-to console for great local multiplayer experiences, Rocket League an absolute blast when shared with friends. Two player is perfect on the go, both Joy-Con breaking off and working well to control your car while docked mode extends this to four player split-screen. Much like playing online you’ll find it tough to tear yourself away always making an excuse for just one more game. Every match you play earns you a random cosmetic item for your ride be it wheels, hats, antennas, liveries or even the visual effect of your boosting (my personal favourite being bubbles). There is plenty to unlock offering endless combinations and chances to make your car look unique. Play long enough though and, eventually, you may earn a locked chest containing a very rare item. These can only be unlocked with keys purchasable through the Nintendo eShop though and rather annoyingly the flashier and better cosmetics are locked away behind these microtransactions. Each chest might tease its potential contents but there is no guarantee what you’ll get so every opening is a true gamble. My first three unlocks for example contained skins for cars I didn’t even own leaving me feeling a little cheated. Thankfully the microtransactions are completely optional as well as cosmetic – unlike some other big AAA releases at the moment that do not offer advantages to those who buy them. 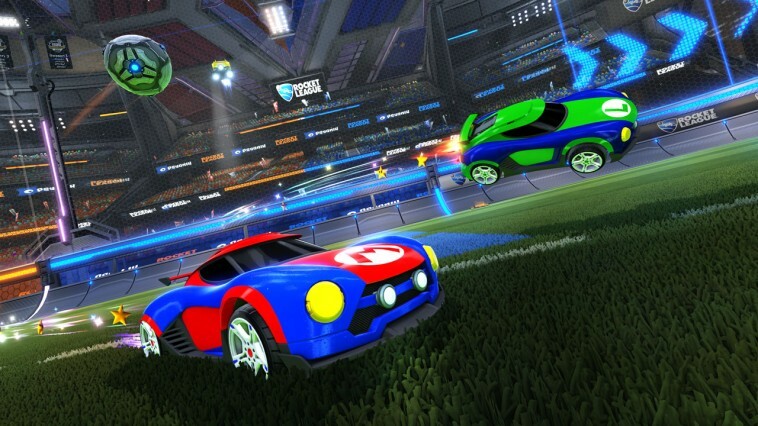 If there’s one area where this version of Rocket League suffers, it’s the performance. While not terrible by any means, you’ll often notice the rougher textures of some stages or a general fuzziness especially when playing online. Still, everything runs nice and smooth at 60 frames per second which, let’s be honest, is more important in a game like this. When all is said and done, Rocket League on Switch is a great version of the game. It manages to deliver the same addictive experience as its more powerful siblings whether playing docked or handheld and, even though graphically it may not be as strong, this is an easy recommendation for any Switch owner.